The path of the Degel Machaneh Ephraim is to stay FAR away way from machlokes and to always concern oneself with promoting the ways of shalom in the world. This is what the Sudilkover Rebbe told me as I sat across from him on Rosh Chodesh Kislev. The Rebbe told me that his father had ingrained this outlook into his mind and that this was the reason why he visits the Ohel of the Lubavitcher Rebbe on Gimmel Tammuz and the Ohel of the Satmar Rebbe on Chof Vav Av; it is why he visits both rebbes of Satmar and both rebbes of Bobov when he is in the United States. By "chance", we opened up a Degel Machaneh Ephraim and learned a short shtickel in the Likkutim which further illustrated this point. There the Degel related how following Rosh Hashana one year his grandfather, the Baal Shem Tov, told him what he had witnessed in the celestial worlds during his davening. 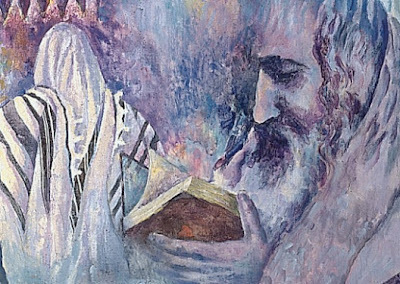 The Baal Shem Tov explained that Avraham, Yitzchok, and Yaakov sought out and gathered together all the merits of the Jewish people and brought them before the King of Judgment. Moshe Rabbeinu was also there acting as a broker; ensuring that the scales would tip to the side of merit and turning away any accusers who attempted to bring the sins of the Jewish people and offset the scale of judgment for a unfavorable verdict. Since we are to emulate the ways of the Avos, the Rebbe explained that this piece in Degel teaches us that a main component of our avodas Hashem is to seek out the good in others and in ourselves. As we walked back on 16th Avenue after davening Mincha, the Rebbe returned to this underlying theme in our discussion of seeking out the good. The Rebbe asked me to name five good things about myself. After naming one or two fairly quickly, I struggled a bit to get to five. The Rebbe then asked me if it was possible for me to name five bad things. To this, I answered, "Of course! I can tell you a million of them." The Rebbe frowned and quoted the famous Gemara (Sotah 3a) that states that a person does not commit an aveira unless a momentary ruach shtus (spirit of insanity) enters him. The Rebbe explained that the ruach shtus is created at the moment when a person fails to see the good points and focuses only on what he perceives to be bad. He then instructed me to review Likutey Moharan #282 and then told me he had specific advice for me. Right at that moment, Chabakuk Elisha's car pulled up and my time together with the Rebbe came to an end. It would not be until the next day until the Rebbe gave me his advice which entailed a 40 day implementation plan that he directed me to start that very day. That I did. At the conclusion of this 40 day period ending on the 12th of Teves, I will write another posting with the details of the Rebbe's advice and how I went about following his plan. Question - I live in Ramat Beit Shemesh and I see the Sudilkover Rebbe often. I didn't know he is a Rebbe. Does he have Chassidim? I can tell you this: Your post certainly awakened one bad middah in me; impatience! I have to wait five weeks to hear his advice!?? That wasn't fair ASJ. Why cause pain to another Jew? You could have waited the five weeks and then told us what you had been up to for those 40 days. Now I have to suffer until Asarah B'Teves! Yehupitz: The reason I am waiting until Teves to post about his advice is because I want to be able to tell you what a difference it made in my life once the 40 days is up. As the days go by, I continue to get new insights into this process which I also plan to include in this posting. Rest assured that I have about three other postings related to my meeting with the Rebbe that I plan to post before that time. I am actually now working on one now about his opinion on the issue of birthdays/tikkunim. I understand why you are waiting. It's the tease right now that is making me itch. I looked up the Azamra site. Beautiful. I think it's the first piece in Likutei Halachos Orach Chaim too. The Rebbe's comment about naming 5 bad points remind me of a game (the concept is not my own) I use to play with middle school kids when I was involved with kiruv. I'd ask kids to come up with a list of bad things they could say about someone. The list would be a mile long. Then I'd ask them to come up with a list of good things about a person. The list would be dramatically shorter. Again, thank you for giving us much to think about, ASJ. Thanks for the post. It came at good timing to find it. Did the Rebbe recommend what to do when someone accuses falsely accuses one of negative points. How is one to deal with it and how do you find the good in such situations?